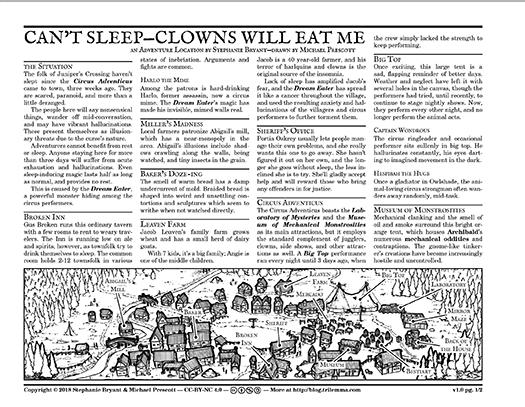 The good folk of Juniper's Crossing haven't slept a wink since the circus arrived, and not for lack of trying. People are starting to see things that aren't real, and—even worse—some things that are. This adventure was written by Stephanie Bryant, whom you might know as the author of the Threadbare RPG. She has served up an intense, layered, horror experience. To spill the beans, deep inside the circus is something horrible, a "dream eater" that both keeps everyone awake, and causes their insomnia-fuelled hallucinations to manifest as shared illusions. 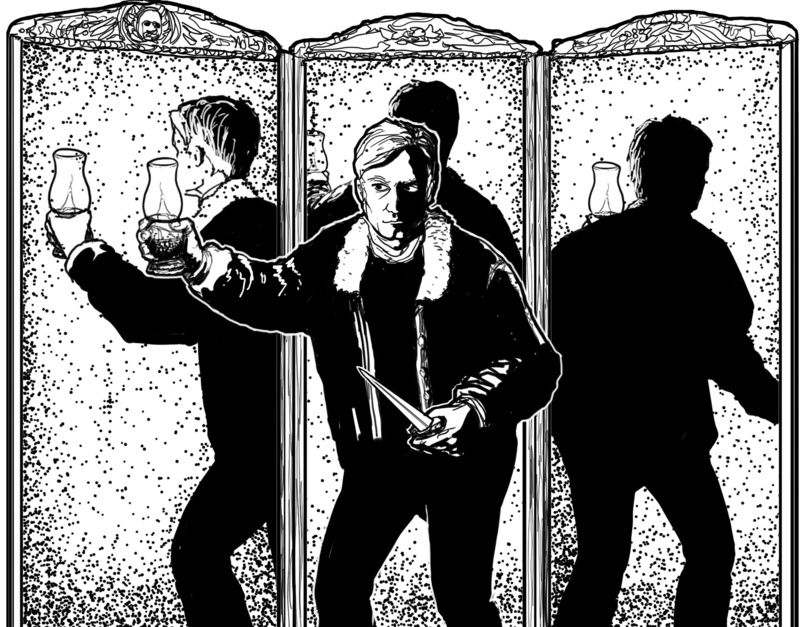 To top it off, the thing nests in a mirror maze with a quartet of dopplegangers. The potential for gaslighting by gaslight is completely over the top. This adventure is potentially set in a different time than some of the others—P. T. Barnum clowns definitely evoke a period of American history in a way that my other adventures don't, and I really enjoyed where this took me, personally. There's this aspect of fantasy worlds that are artificially eternal, as if somehow gunpowder, internal combustion, and industrial revolutions will never occur. At the same time, I find it fascinating to imagine a modern world that is somehow living out the past echoes of violent, fantasy world with its hardscabble holds surrounded by monster-infested wilderness. In my imagination, the nightmares of Juniper's Crossing are like the PTSD of a whole landscape, brought into painful reality by the dream eater. Anyways, that's just my reaction! You can just as easily treat this as a slice of modern Americana, mythos investigation by gaslight, or just treat it as straight-up D&D-esque fantasy adventure. I also have to say, a distorted mirror maze is one of the most dastardly places I've ever heard of stocking a mimic, that's just evil. As always, the text and illustrations are all released under CC-BY-NC, so feel free to use and remix them non-commercially.